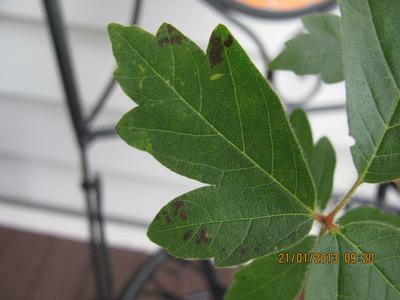 Recently I noticed my trident maple started getting just a little of black spots on the leaves. So I sprayed it with water with the hose pipe because I thought it could be a aphid problem. 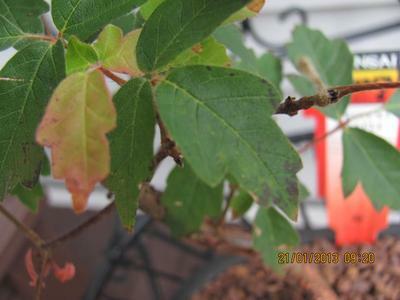 The problem stopped for just a few days then some spots appeared, so I used a soup insecticide recipe. 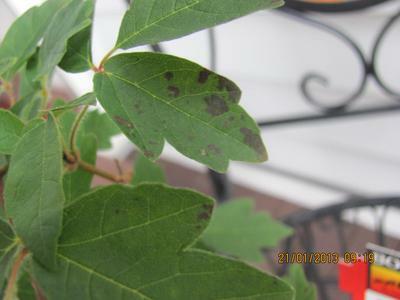 The next day there were more black spots on the leaves and the black spots spread throughout the plant. I don't know what is causing this. I sometimes spray water on the leaves when I water it 1 every 3-4 days. And know I have a problem that is getting worse every day. I stopped spraying water on the leaves and this hasn't help! I need help! 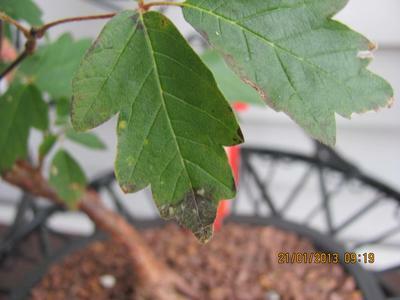 I think this looks more like fungal damage than an insect problem. You could spray for this or just wait for winter and spray before the new leaves appear in spring next year.